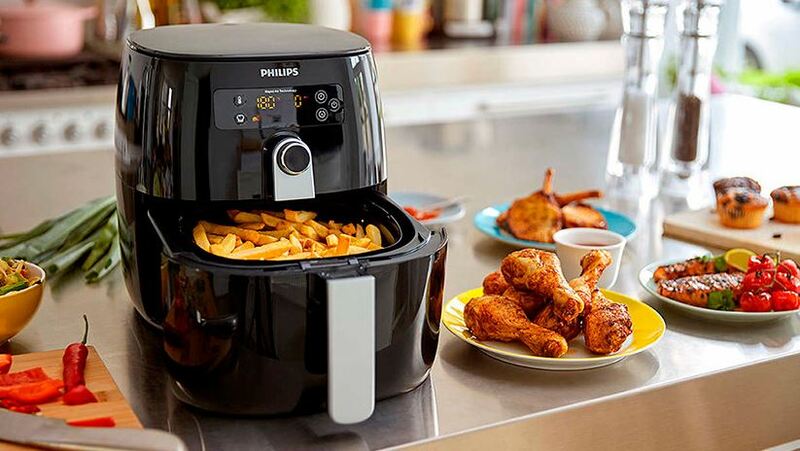 Airfryer was invented so that you can have fried food without the use of oil. We all know fried foods are not healthy, that is because it was fried with oil. But what if we don’t need oil to fry food! Airfryer made this insane idea possible. We already wrote about the benefits of Airfryer, and how to use it. Now, we will the best ways of maintaining and cleaning air fryer. Any cooker gets filthy after cooking. Although because of less oil usage, air fryer gets less dirty after a single use, you should still clean in afterwards for your hygiene. It is also important to do the maintenance regularly to make sure the air fryer does cause any electrical hazard and also does not make the foods unhealthy. In this article, we will guide you through to the best ways of maintaining and cleaning air fryers that will keep it in optimum condition for a long time. When You Should Clean Your Airfryer: Yes, air fryer does not get as messy as a regular cooker. So, you will not discover much greasy dirt inside. But a bit of potato might get attached to the inside body, so we suggest you clean the air fryer after every use. Granted that you can use it without washing daily, but you really should not, as you much find yourself cleaning loads of junk! The Removable Parts: We recommend you to clean the basket, tray, and pan after every use. You can wash them by hand using soap or cleaning spray and warm water. Some, or all of them (depending on the model) can also be washed by sinking in the dishwasher. Although we suggest you check the user manual before to make sure that they can be washed by the dishwasher. Because not all the air fryers parts are dishwasher proof. After putting the parts into the dishwasher, the soft, warm water of a dishwasher clean the mess in 20-30 minutes. Then let the parts to be air dried for a couple of hours, and it should be okay to use. The Interior: The interior should be cleaned more carefully though. After removing the above-mentioned parts, spray cleaning materials and then use a soft and damp sponge and wash it dry. You can then turn on the fryer for 20 minutes at around 200-degree Celsius. Your air fryer will be up and ready to use. Do Not Use Abrasive Material: Cleaning your air fryer with an abrasive, scrubby material can be seriously harmful to your air fryer. It can damage the coating inside the air fryer and that will result in your food getting struck into the air fryer. Never Submerge Your Airfryer in Water: The body of air fryer should be submerged into water. The electrical parts can get damaged if you sink it all together into the water. Although some part can be opened and waterproof, the electrical part is not. So keep that in mind while washing your air fryer. Always follow User Guide: Before start using your air fryer, read the whole user manual. Different air fryer has a different mechanism, and there are some things you should do and some things you should not. So make sure you are following the user guide for a smooth air fryer cooking experience all the way. Give it Some Space: Airfryer needs some space around it to vent stream, so you should never keep close to a wall. Not giving it enough space may result in to get it overheated. This could be very costly in the long run. Keep it in Level Surface: Always keep your air fryer upright, and put it on a level surface while cooking on it. It is good for your air fryers health. Check for Dust and Debris: Before start using your air fryer after a long time, check the inside if any dust and debris are sticking into the body for smooth operation. Using and cleaning an air fryer, both are super easy. If you do the maintenance properly, you air fryer can serve you for a really long time. And we already know how useful an air fryer can be if you are a fried food lover. It can simply fulfil your cravings and keep you healthy. We assume you already have your air fryer and loving it, and we expect this guide has helped you on how exactly you should clean your air fryer.